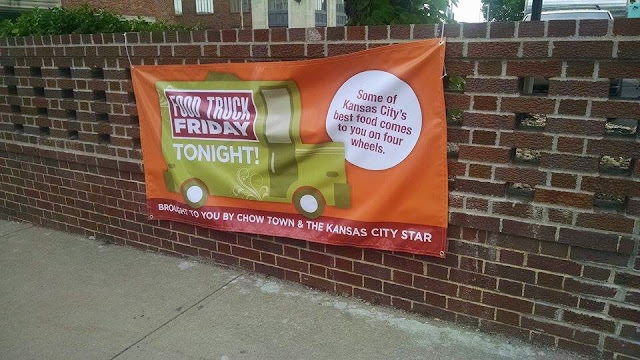 This weekend I had a few minutes to dash over to our local downtown KC food truck Friday and pick up cupcakes from two different food trucks who have recently changed ownership. I had tried one of them before in a previous iteration, but it's always good to check out the progression of a business too. Coffee Cake KC is a combination coffee and pastry truck that carried cupcakes from a local bakery named Three Women and an Oven. 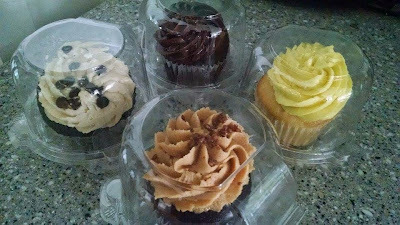 The slightly larger than medium cupcakes were priced $4 each, including tax and came two each loose in the bottom of a brown paper sack. 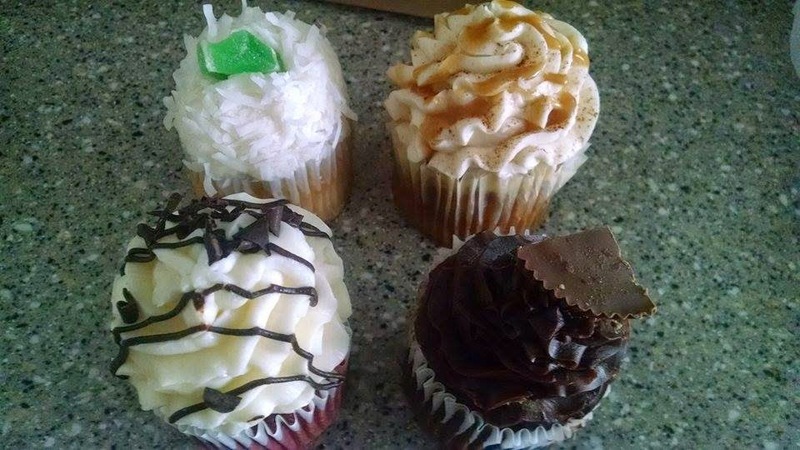 I chose the four pictured above: key lime coconut, bananas foster, chocolate peanut butter and red velvet. The bananas foster was nice until I encountered the bitter alcohol-esque after taste. The red velvet cake was dry and tasteless and the icing wasn't sweet enough to balance the cream cheese flavor and it was also kind of greasy. The chocolate peanut butter was very dark with a strong flavor and since both of the flavors were mixed together in the frosting and the cake, I didn't like not being able to enjoy them separately. The other cupcake food truck was from The Sweet Tooth. This was the debut of their brand new van, because the old one (formerly of 3 Girls Cupcakes, then The Sweet Tooth) died. 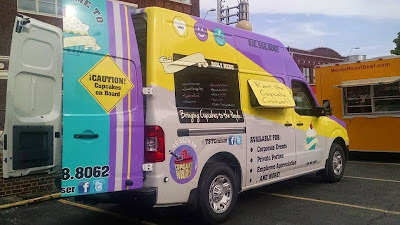 Note: Full disclosure, but most people who read the blog should already know I am the original owner of 3 Girls Cupcakes and the van that died. However, none of the cupcakes themselves came from my part of the business that day. Their medium sized cupcakes were $3 including tax, with a break if you bought four or more and they came in individual plastic clam shells placed in a grocery bag to carry. I chose chocolate chip cookie dough, chocolate peanut butter, chocolate salted caramel and lemon. They were all very moise and fresh. The chocolate chip cookie dough was my favorite because it got the taste of cookie dough just right. The peanut butter wasn't sweet enough to balance the pure pb taste for me. The chocolate salted caramel just tasted like a chocolate cupcake to me, but a very good one. The vanilla cake of the lemon cupcake had the consistency of something store bought, but the lemon frosting was really yummy all by itself and throw in the fact that the middle contained lemon curd and it's definitely one I would get again. 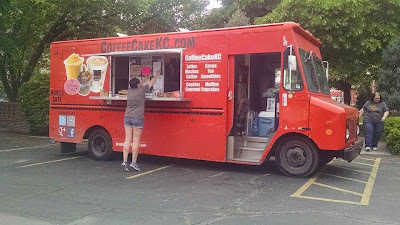 Overall, The Sweet Tooth Cupcake Cruiser definitely had the better product, the better price and the better packaging, but Coffee Cake KC is more known for its coffee in any case. I should probably schedule a trip to try their cupcakes directly from the retail shop some time.